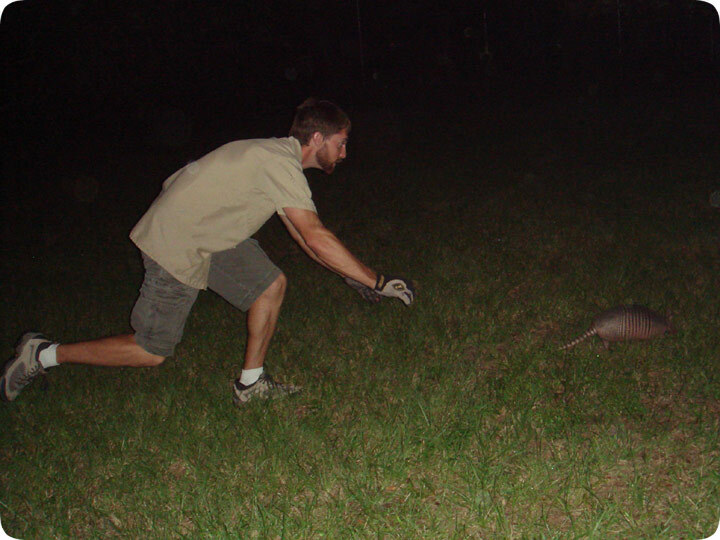 02.25.2006 - When the armadillos get going, and I have no traps at my disposal, I have only one option - to chase them down with my bare hands, leap upon them like a mighty lion, wrestle them to the ground, and then lose my grip on them and watch them flee into the forest. One might think that armadillos are slow - what with the shell and all (snails, tortoises, clams) but no, they're quick little buggers. They scoot along in a series of quick, powerful hops. I scoot along after them in a series of clumsy, awkward hops. Once I get near, the armadillo changes direction and blasts off ninety degrees to the side, and I end up skidding off too far, and the dang thing gains distance on me. With any luck, I get my hands on it, but then it kicks and bucks and I let out a girlish yelp and I lose my grip and then it squirts away again. I'd use a big net, but I don't carry a big net with me on Tuesdays. (I chased this one on a Tuesday). So it got away. That's my instructional guide on how to catch armadillos by hand. Removing an Armadillo From Your House - Finding an armadillo inside your house is really quite a rare occurrence, as these are timid and cautious animals which will rarely choose to enter a property unless there is some tempting aroma to entice them in. If you do discover an armadillo in your house then it is likely to be quite confused and traumatized, so it is important to look to see if it is injured or hurt. When you are happy that the animal is in good health, then you can try to shoo the animal towards the door using a broom, otherwise, if you leave a clear route to the door then it will usually leave of its own accord. A more difficult challenge is if you have found that an armadillo has actually burrowed under your house, because they really can cause some damage to the underside of your house. The best way to deal with this solution is to trap and remove the armadillo yourself, or to hire a professional to do this for you. Once this is done then you will need to fill in the burrow so that it isn?t chosen by another armadillo, as they will look to find existing burrows where they are available. Armadillo Catchers - Finding that a lawn or yard has been dotted with small holes is not an uncommon occurrence, particularly in the south eastern states of the USA, and this is often because an armadillo has been in the yard. Fortunately, there are plenty of pest control experts who have the skills and tools to solve the problem, and whether it is a rare occurrence or a recurrent problem with a number of armadillos they will help you to find a solution. Armadillos aren?t particularly clever or elusive creatures, as their hide is their main defense mechanism, so catching armadillos is usually quite quick for an experience professional. It is also worth hiring someone to help with the armadillo problem as they will often be much more familiar with local laws regarding catching armadillos, and you can be sure that you won?t break any laws. The majority of animal control professionals will use cage traps to catch armadillos, and in some cases they will not even need to use bait in order to catch the animal. Dealing with a pest animal yourself is always an option, but many people will be much happier using a professional to do the job well.